The history of horse & human goes back thousands of years. Horses have been a key factor in developing our societies for as long as we can remember. They transported & carried us, fought for us, & hunted with us. They herd our cattle, carry us over fences, play games for us, & have become our faithful friends & companions. More & more people are now realizing that horses have more value than we ever thought, far beyond being just our beasts of burden. Centers are opening up worldwide using these majestic animals for our emotional healing, therapy, & rehabilitation, as we now know that the mere presence of a horse can reach places no therapist can. Unfortunately, however, as our lifestyles get more hectic, our land gets more crowded & our minds get more stressed, the effects are passed down to our horses. They are being removed from the comfort of their herds & grazing lifestyles, & forced to spend a lot of time alone & bored. As a result, horses are suffering more often from gastric ulcers, colic, restlessness, tense muscles, & undesirable behaviors, just to a name a few. Performance horses, as professional athletes, experience the added strain of sore muscles, fatigue, demanding travel, & training schedules, in addition to the stresses that the modern horse is living with. 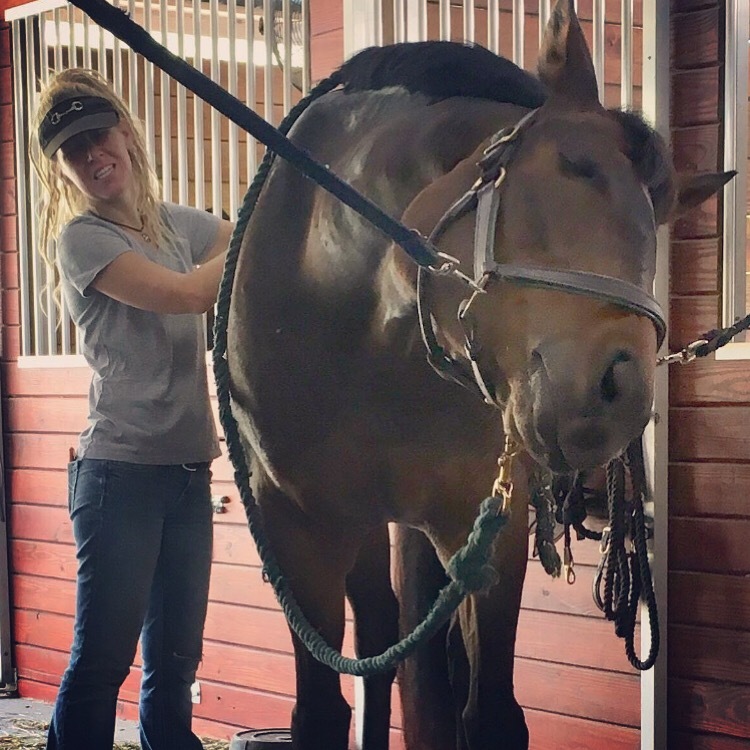 Alaina Reed at Equine Shakti offers Equine Sports Massage, Performance Bodywork & Shamanic Energy Healing to help your horse with this process of releasing & healing from all of this stress & tension. A combination of these modalities will be combined especially for what your horse is asking for at the time of the session. As we all know, every horse is different. Some horses will need to start with energy healing, as deep hands on massage work is too much for them to handle. Others need the massage & bodywork manipulations, because they are not yet ready for the energetic trauma healing. Every horse will be a guide for what they need at that moment, & Alaina will be sure to listen. Equine Shakti also offers yoga classes designed specifically for equestrians. They can be taught on the yoga mat at your barn, or in the saddle on your horse or a combination of both. Yoga increases our awareness & level of relaxation. When we approach our horses from a heightened state of awareness and in a less stressed headspace we allow them to remain calm and peaceful. Yoga also will increase our level of flexibility and strength, especially in our hips & pelvis. This allows us to relax and be more free & graceful in the saddle, which in turn gives our horses more comfort while we are on their backs. Alaina Reed is a lifetime horse lover & equestrian. She has a BS in Psychology from Colorado State University, and is a Graduate of The Four Winds Society – Shamanic Energy Healing – Light Body School. 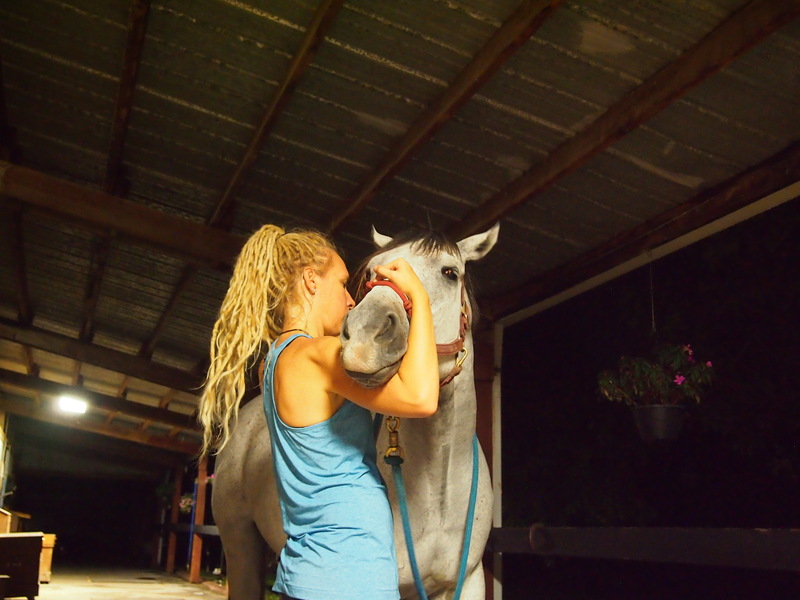 She studied Equine Sports Massage at Animal Dynamics in Ocala,FL & is currently being certified in the Masterson Method Integrated Performance Bodywork. 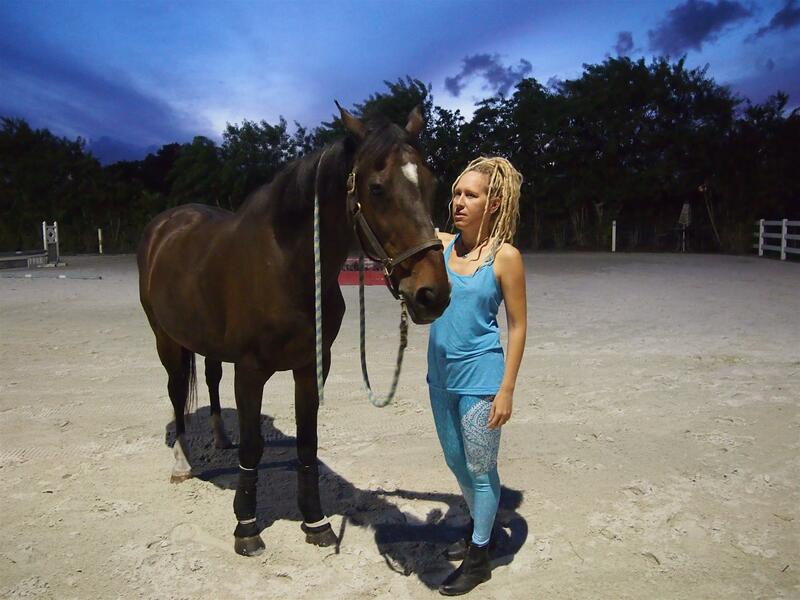 Alaina is also a registered Hatha Yoga Teacher through Keshava-Radha Yoga, and received her Horse & Yoga Integration Teacher certification from EquineOM. Aside from her love of horses, shamanism, & yoga, she is a musician & a recording studio owner. For more information about Alaina please go to www.AlainaReed.com. This combination will be performed for approximately 1 1/2 - 2 hours. Your horse will release much tension that they cannot release on their own. Horses are herd animals in nature. They want to appear strong in the herd & do not complain about pain or tension they can cover up. They hold this tension in their bodies & keep it there unable to release it. When they finally appear lame it can be from tension accumulated from months or years ago. They also hold on to emotional & physical trauma for years or lifetimes. Horses need our help now, to assist them with releasing all of this. 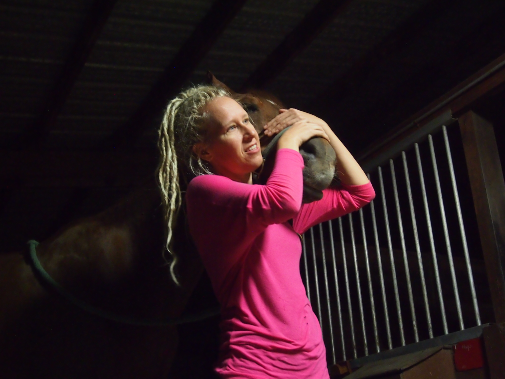 Alaina incorporates Equine Sports Massage & Performance Bodywork into her healing sessions. Bodywork includes massage, various systems of touch and manipulation, relaxation techniques, and practices designed to improves the body’s energy flow. Bodywork can help horses with tight muscles & fascia, anxiety, scar tissue tightness, spinal alignment, anxiety, nervous habits, and generally just feels good like a yoga class or massage would make us feel. She is currently being certified in the Masterson Method of Integrated Equine Performance Bodywork. According to Jim Masterson founder of the Masterson Method, we can learn to recognize and use the responses of the horse to our touch to find and release accumulated tension in key junctions of the body that most affect performance. We can access that part of the horse's nervous system that will give us certain signs that tell us where tension is being held in the body, and when it is being released. When we use the correct level of touch or pressure, and follow what the horse's own body is telling you, it will release the tension it is holding onto. Shamanic healing is also performed on your horse when required. This helps the animal heal at a soul level from trauma. 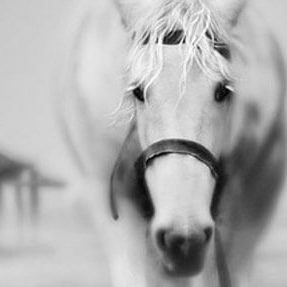 Horses benefit from Chakra Illuminations, Extractions, & Soul Retrievals just like we do. When we shift at the energetic level, our view of our selves & our surroundings shifts also. 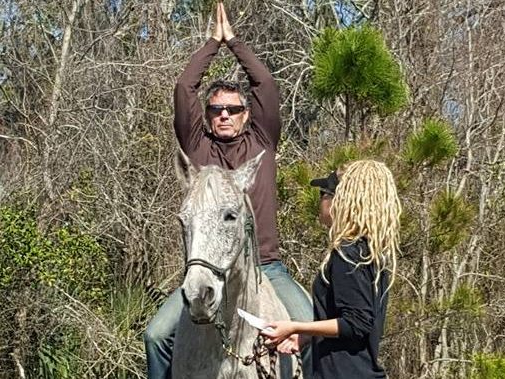 Yoga practice on & off the horse. This will help with bonding with your horse. Trust issues with your horse. Fear of horses. It is also great fun! Alaina completed teacher training at Equine Om – Horse & Yoga Integration. Horse & yoga integration blends horses & humans through a series of yoga postures & practices. According to Equine Om, it is a unique combination of Mediation, Yoga, & Equine Therapy providing an amazing & unexpected experience. Hatha yoga taught in the method of Keshava-Radha yoga. Release tension, & increase relaxation & flexibility. Will teach at equestrian facilities with specific classes to improve riding. The Keshava Radha style of Hatha Yoga specializes in encouraging slow, meditative practice emphasizing breath and awareness, while creating physical and emotional balance, as well as strength and flexibility. Hatha Yoga classes include Vinyasa (Flow), Asanas (Posture), Pranayama (breathing exercises) and relaxation. When we practice yoga, we can approach our horses from a heightened state of awareness. We will be more open to receive subtle cues from them, on how they are feeling physically & emotionally. Yoga will greatly improve our riding by making us stronger & more flexible especially in the hips, pelvis, & spine. When we are tight in these areas we are really putting our tension right into the back of our horses. Yoga will help us gain this mental & physical flexibility, & more importantly a calm mind, body, & spirit. For more information on the Keshava Radha style of Hatha Yoga, please visit www.keshavaradhayoga.com. Healing addresses the cause of disease, which shamans believe is due to imprints of trauma stored in a person’s Luminous Energy Field (LEF). No two shamanic healing sessions are the same. According to Alberto Villoldo, founder of The Four Winds Society, there is a difference between “curing” and “healing”. Curing is the business of doctors. Healing is the business of the Shaman. 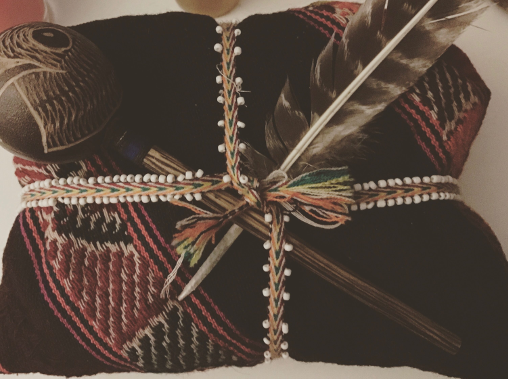 Shamanism is the most ancient healing modality based on our connection with nature, creation, & all of our Mother Earth. It is spirituality found in all indigenous tribes. No healing session is exactly the same, but all have similar structure. Sacred Space is opened by calling in the Four Directions, Heaven, & Earth. The clients Luminous Energy Field (LEF) Is checked to determine if and where sludgy energy exists. Then, a chakra illumination is performed to clear sludgy energy from the client’s Luminous Energy Field (LEF). When necessary Soul Retrievals, Extractions, Cord Cuttings, & others are performed. When the LEF is altered it creates changes in your life. We start to see life with a new energetic map of health and wellness versus one that is programmed with our old patterns & beliefs. Bodywork, massage, and healings of any sort are not a substitute for veterinary care, diagnosis, or treatment. You are always advised to consult a veterinarian regarding your animal’s health and treatment options. Always seek immediate veterinary care for animal emergencies and suspected health concerns. Alaina is amazing with the horses. They are so loose and comfortable and relaxed after she works on them. It is definitely a noticeable difference. So lucky to have her working on my boys! I've seen Alaina work on the horses, and she has personally worked on me!You can see and feel the difference in the horses after she is done working on them, they are so relaxed & their energy is just lighter!When she did an extraction from my shoulder, I instantly felt the difference! A few days later and it's still less tense than it ever has been! She makes you feel comfortable so it is easier for you to release what no longer serves you. She's very passionate & genuine! Absolutely awesome!! Watching my horse who is young, playful, tense and never sits still transform into a mellow thinking creature was awesome. Alaina takes her time and will make sure the horses relieve their tension with patience and skill. Her session with him definitely helped ease his mind and body. I Would recommend anyone who is looking for that extra something to get through to their horse, to contact Alaina! An amazing transformation occurred with my mare. A traumatic situation caused her to physically & emotionally break down. It took Alaina months & months of patience to work with her. Through her healing energy, she brought her back from a very dark place. My mare stood quietly for the first time(she usually tried to kick & bite her) & allowed Alaina to do bodywork on her. Alaina has a gift & a love of these amazing creatures. Forever grateful she is part of our lives. Thank you so much! You may also contact me through the form below.